Rugged, reliable, multi-station, multi-function, battery powered controller and programmer. Traffic medians, roundabouts, rural properties, construction sites, municipal parks are all places that lack standard electric power. The Wireless Valve System allows all these areas the benefits of automatic irrigation. There is no need to reach inside the valve box to hook up a field transmitter and download program instructions; the programmer can communicate with the controller from as far as 30m away. The control unit is fully submersible and waterproof up to 3.5m, making the unit rugged enough to take on whatever water mud and debris might be found in a valve box environment. 9 Volt battery guaranteed to last longer than one full season. Fully submersible and waterproof to 3.5m. No moisture intrusion, even in humid valve box environments. Station run time: 0-240 minutes in 1 minute increments. Start times: 9 per day. 7-day calendar or interval (1-31 day) watering. AM/PM or 24-hour clock option. Programmable rain delay for 1-7 days. 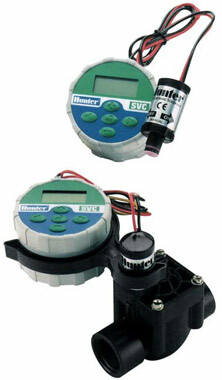 Compatible with most common 2-wire 6-9 Volt DC battery operated solenoids. Battery: Standard 9 volt alkaline battery (not included). Battery not required for program backup. Memory: non-volatile for program data. Reliable battery–powered control without the need of electric connection. For isolated sites or power-restricted areas and for the special needs of drip zones, Hunter provides the ideal economical answer. The SVC mounts to a valve solenoid quickly and easily – without screws, drills or additional wires – and the unit’s solid contruction ensures it can handle the harsh environment of a valve box. 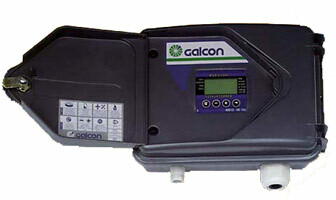 Battery operated controller used to control Galcon DCV-25 actuators for watering lawns and garden beds. Indenpendent station programming, single station (DC1) and 4 stations (DC4). Up to 4 start times per station. Watering time from 1 minute to 12 hours. Irrigation schedule – 7 day calendar or interval from 1 to 30 days. Controller is powered by two 9 volt akaline batteries. Operating pressure range 70kPa – 1000kPa. DC1 supplied with 1 DVC-25mm. * Check velocity in pipe work may exceed industry standard for safe irrigation practices. 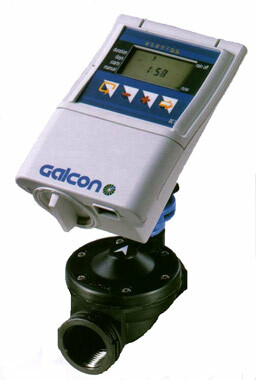 Battery operated controller used to control Galcon DCV-25mm actuators for watering lawns and garden beds. Operation of 6 to 12 valves plus a master valve (or pump using latching relay, optional extra). 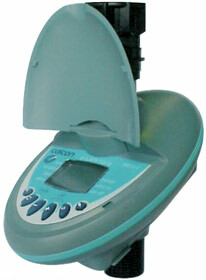 Separate irigation schedule programmable for each valve. 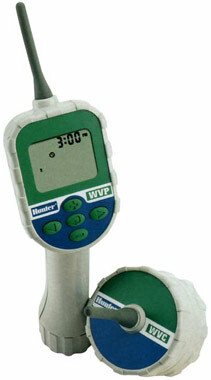 Up to 4 irrigation activations per day per valve in programmable weekly schedule mode. Irrigation window in cyclical program mode (Loop mode). Irrigation duration: 1 second to 12 hours. Irrigation frequency from once every minute to once every 30 days in cyclical program. Manual operation of individual valves. Sequential manual operation of all valves. Operation of valves up to 50 metres from the controller. Operated by four 9V alkaline batteries. Operated by two 9V alkaline batteries. Battery operated hose tap timer. – Can be set to water on specifica days. Irrigation Duration from 1 minute to 12 hours. Up to four start times per day. Electronic manual operation via the controller. Internal filter installed in the controller. Operated by a 9V alkaline battery. Battery lasts up to one season (Pending site and operating modes.). Battery – 9V alkaline (optional extra).